Sprinkle natural Epsom salt and essential oil into your bath to recharge body and soul after a hard day. 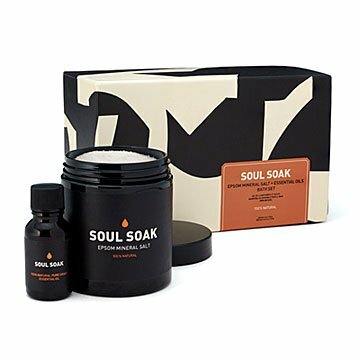 Step into a Soul Soak bath a hot mess of jangled work nerves, and arise from it afterward with synapses singing, radiating joyful vibes. Grapefruit and lavender essential oils lift you up and mellow you out. Pure, harvested Epsom salt relaxes and soothes sore muscles while softening skin. Just sprinkle some of the salt and a few drops of oil into a fresh, warm bath to melt away the kinks, release mental tension, and recharge body and soul. When you're done, watch your spent, jangled nerves circle down the drain. Comes in a elegant, unisex packaging. Made in Canada. For optimal use, add 1/4 (2 oz) of the bath salt bottle and 10-15 drops of the activating essential oil blend to a warm water bath. Essential oil blends can also be used in a diffuser.